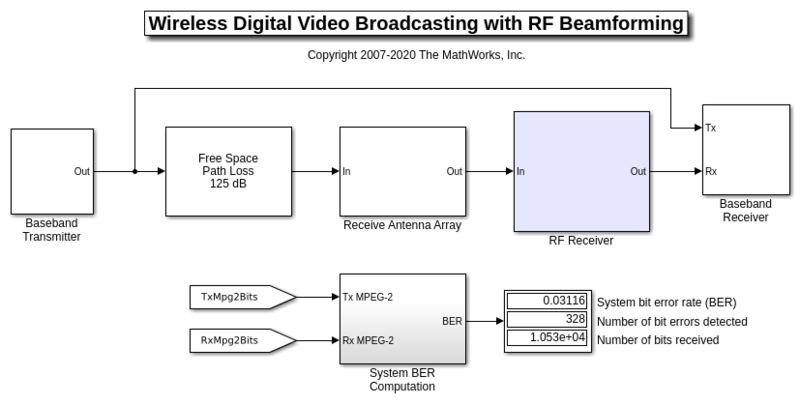 This example shows how to model a digital video broadcasting system which includes a 16 antenna phased array receiver operating at 28 GHz. The baseband transmitter, receiver and channel are realized with Communications Toolbox™. The RF receiver is implemented with the RF Blockset™ Circuit Envelope library, and the receive phased array antennas are constructed using Phased Array System Toolbox™. The 4 x 4 planar phased array feeds a 16 channel receive module that includes phase shifters to enable RF beamforming. Baseband Transmitter subsystem is responsible for generating a 64-QAM, 2 MHz bandwidth signal that adheres to the DVB-C standard. Channel effects in the form of path loss. 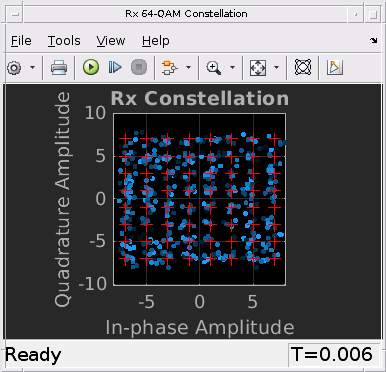 A 16 element phased array receiver arranged in a 4 X 4 rectangular grid. This includes design parameters for operating frequency, element radiation pattern, and receive direction. 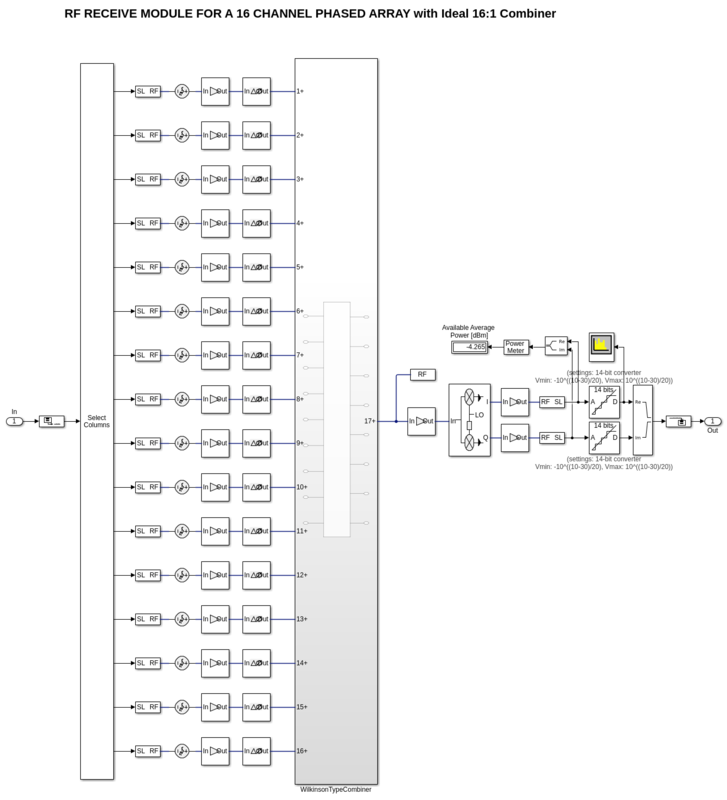 A RF receiver module consisting of 16 paths. Each path includes LNAs and variable phase shifters for RF beamforming. The network of 2:1 power combiners is constructed twice to emulate a typical design process. 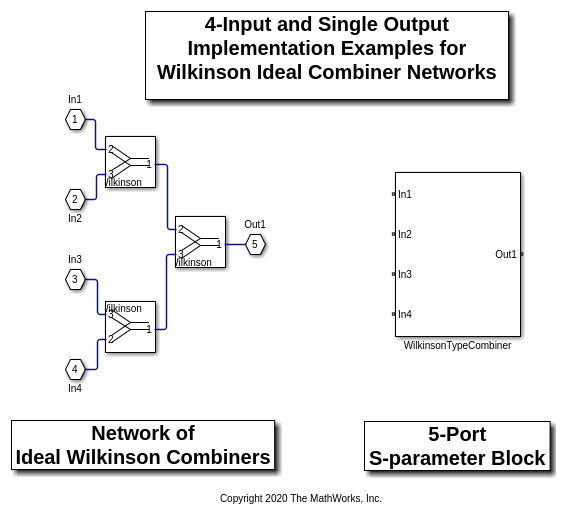 The initial design employs ideal Wilkinson power dividers from the RF Blockset Junctions library used as behavioral combiners, while the second implementation uses actual combiners modeled by S-Parameters blocks from the RF Blockset Circuit Envelope library with measured data supplied via a Touchstone(.s3p) file. 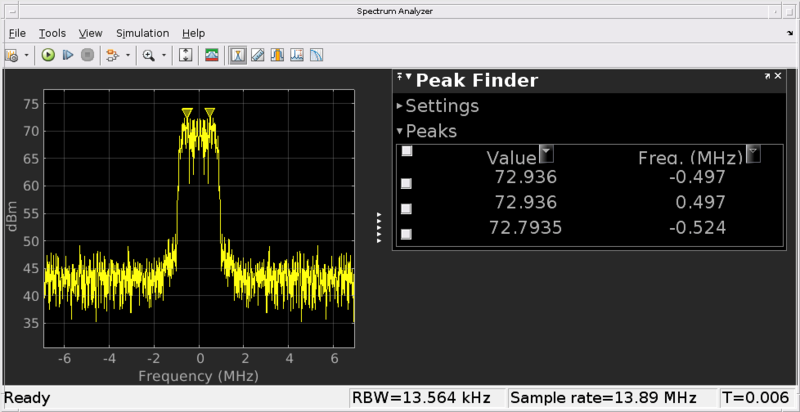 The received RF signal is downcoverted to baseband. Baseband Receiver subsystem is responsible for extracting the transmitted signal. The receiver includes simple models for correcting effects of phase offsets and gain control. 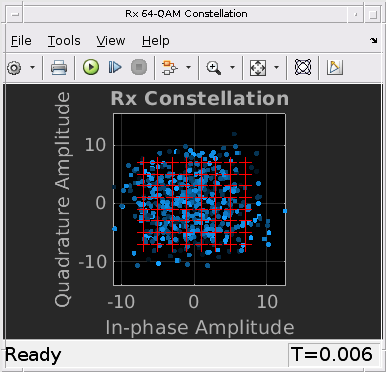 Diagnostics are available at various stages in the system using the received constellation, the bit error rate calculation and the received spectrum. An initial design may use ideal components to speed up the overall design process. For example, use ideal Wilkinson dividers from the RF Blockset Junctions library as combiners in the Receive Antenna Array. The different amplifiers introduce thermal noise and non-linearity. The quadrature demodulator performs direct downconversion, and models the effects of non-linearity, LO leakage, I/Q Imbalance, and noise. Use S-Parameters block to model a real combiner. There are several options available to characterize the behavior of this block; one approach utilizes a data file directly while another approach provides a rational model of the data. For the latter approach, utilize the rationalfit function in RF Toolbox™, save the resulting parameters in the base workspace and use them in the S-Parameters block. 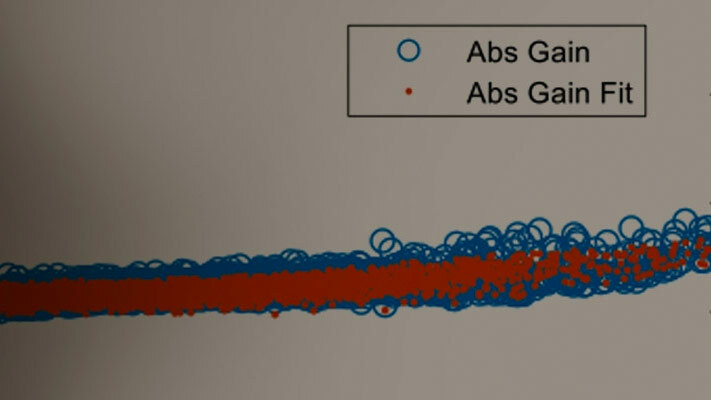 In this example the measured data described in a file is used directly. The transmit side planar array is chosen to have 16 elements and transmits along the main beam (azimuth = 0 deg. and elevation = 0 deg.) 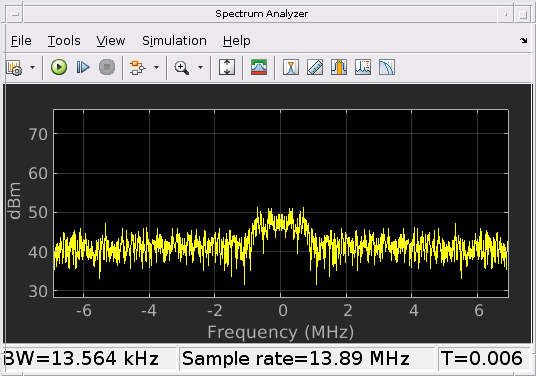 at a frequency of 28 GHz. An isotropic radiation pattern is chosen for each element. Note that the power dividers introduce a phase shift at 28 GHz. This is estimated and corrected in the Baseband receiver subsystem. Modify the receive direction by changing the Receive Direction mask dialog parameter of the 16-element Receive Antenna Array. The angle chosen decreases the signal strength due to the proximity of a null in the array radiation pattern. 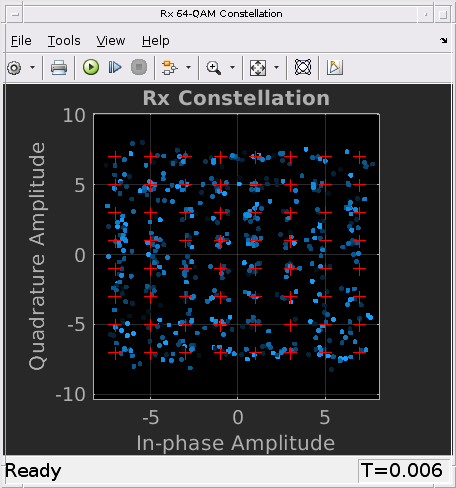 Modify the Beamforming direction parameter for the 4 X 4 phased array on the receive side. 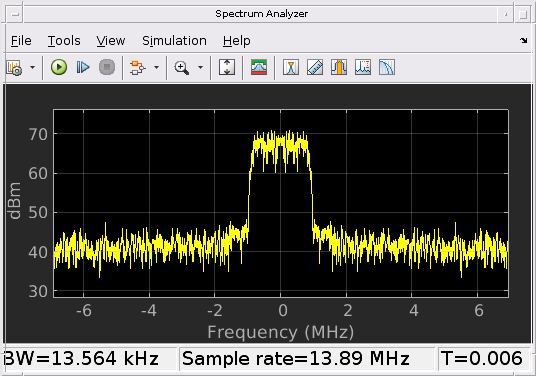 This mask parameter will automatically adjust the phase shift of each channel in the RF Receiver subsystem. 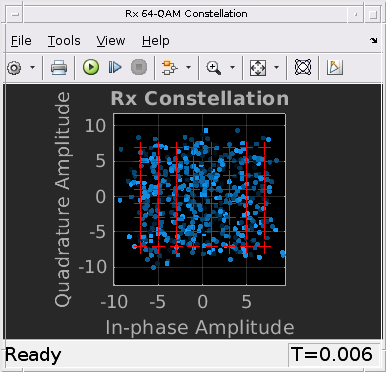 Run the simulation to observe an increase in the received signal level.